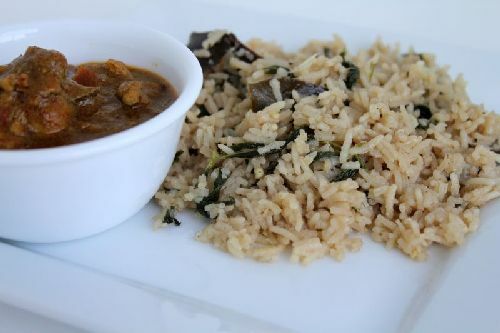 Ghee rice is an easy prep which fits all special occasions. 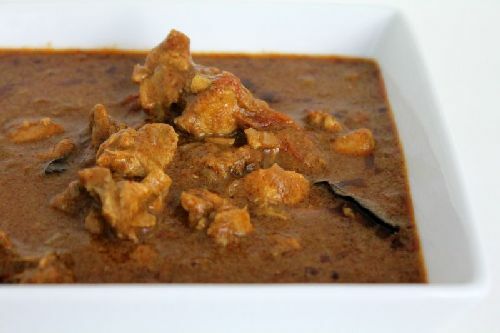 I had it with Nilgiri Chicken Kurma as a side, but this can be combined with any chicken/veg gravy. 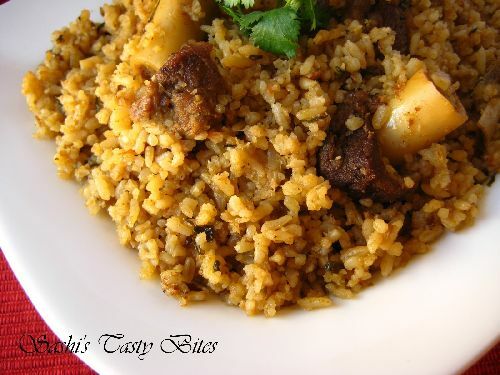 If you are having guests at short notice, here’s a simple recipe to surprise them for sure. My ghee rice turned brown since I added powdered cinnamon otherwise usually it would be more white. 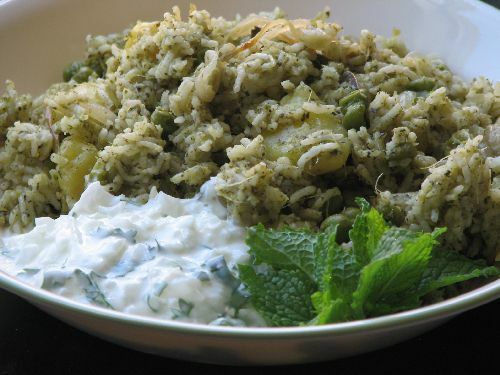 Adding Ghee is optional, but the flavor wouldn’t be affected without it. 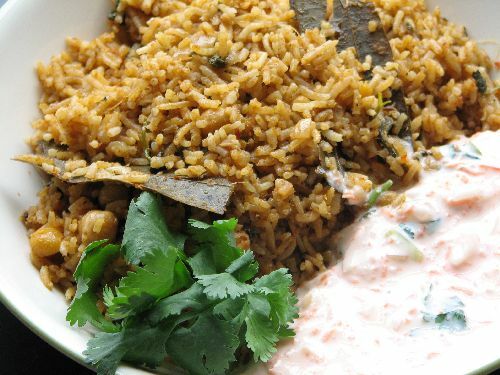 So if you don’t like or don’t want to add ghee, skip it. Adding mint gives it more aroma. Chop Onion. Separate Mint leaves and chop Coriander Leaves. 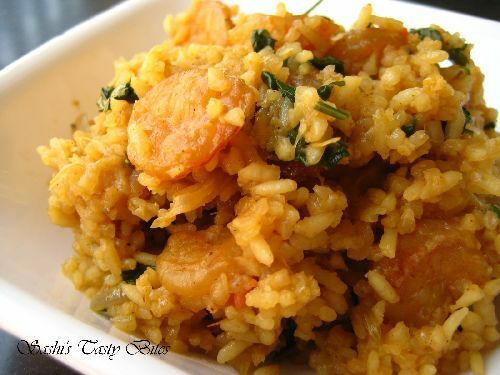 Soak Basmati rice for 10 min (Don’t soak more than 10 min) and wash it throughly. I used ready made coconut milk, if you are preparing from fresh coconut, grind and filter twice reusing the same from the first time (first round grind with 1 cup of water, for the second round grind it with 1/2 cup of water). Split open Green chilies. In a pressure cooker heat oil, add bay leaves, cinnamon, cloves, cardamom. Immediately add chopped onions and green chili. Fry till onion is translucent. Add Ginger Garlic paste and fry till raw smell leaves at least for 5 min in medium flame. Stir often to avoid burning the bottom. Add mint and coriander leaves and fry for 10 seconds. Add 1 cup of water and 1 1/2 cup coconut milk. Add salt and allow it to boil for a minute. Add the basmati rice and check for salt. Add ghee now. Allow it to boil with open lid until the water is absorbed by rice. Now close the lid with whistle on for 20 min in the lowest temperature setting. Using fresh coconut milk tastes fresh. Mint leaves adds nice aroma too. (*) Enjoy this accompanied with any chicken/veg gravy. yummy! will try…i think adding coconut milk will make it more tasty! 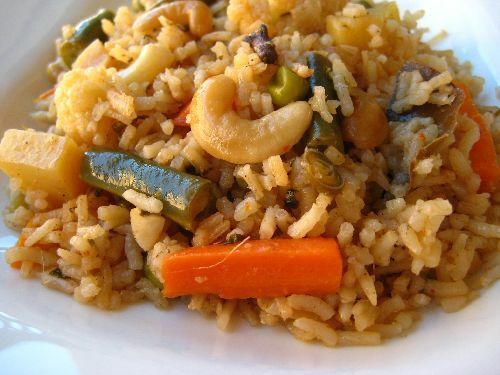 This rice makes my mouth water and reminds me of home childhood when we had this a lot – Looks delicious!!! 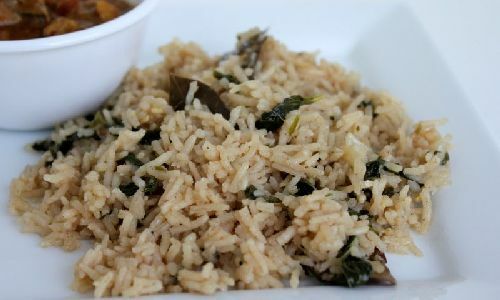 This recipe sounds interesting and dish looks delicious..
is this what they call “Kuska” in South Tamil nadu ?